BOTOX is a great nonsurgical solution for signs of aging in the upper face. BOTOX and other botulinum toxin injectables made up over 60% of total injections performed in 2013. $10 to $13 per unit, roughly $300 to $500 depending on treatment area; no downtime is required. Expressing yourself doesn’t mean you need a furrowed brow, the dreaded “elevens,” or droopy lids. With noticeable results and no downtime required, there are numerous reasons why BOTOX® Cosmetic has been the most popular non-surgical aesthetic procedure for years. BOTOX, introduced in 2002, is the first botulinum toxin to be approved by the FDA. Dr. Buford is a nationally recognized Trainer and Consultant to other medical professionals in the safe and effective use of BOTOX Cosmetic and is a an Allergan Diamond Account Member (Top 1% in the United States). 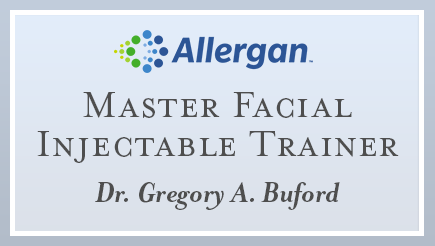 He is also one of around 13 designated Allergan Master Facial Injectables Trainers in the US. While BOTOX can do wonders for improving the appearance of your upper face, there are a number of uses for this effective injectable, such as treating excessive sweating. Contact us today to find out what BOTOX can do for you. “I suffer from clenching my teeth at night. I would wake up with horrible migraines and I couldn’t figure out why. My friend sent me a article on how BOTOX can help…I went into Dr. Buford’ s office and had it done. Let me tell you it works wonders. It’s like night and day! I wake up with no pain, it’s so amazing…” —Actual BOTOX patient of Dr. Buford. Read the full review here. Halting the movement of wrinkle-causing muscles shouldn’t result in a “frozen” face. Dr. Buford and his Physician Assistant Kaitlyn are experienced in creating subtle results, ensuring a natural though impactful outcome. By blocking the signal between the nerve and muscle, BOTOX effectively halts muscle movement for between four to six months. The result? A beautifully smooth upper face that still leaves room for you to express yourself. Need a lift? A brow lift, that is. This quick, non-surgical method of elevating the eyebrows uses BOTOX to temporarily relax the muscles and elevate the brows for four months or more. Dr. Gregory Buford, a board certified Plastic Surgeon and national trainer and consultant for BOTOX, employs his special techniques to keep you looking and feeling your best. Now lift those brows and show the world your sparkle. After all, it’s all in the eyes.